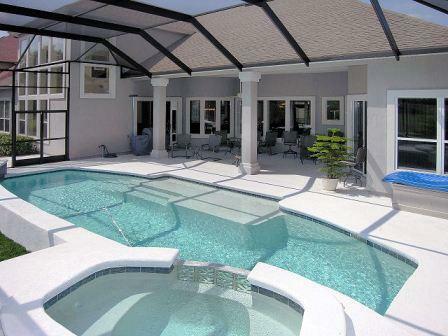 We specialize in building beautiful custom Pool Enclosures. Enjoy your pool all year round with added protection from the sun's harmful rays, wind, rain, pesky mosquitos or errant golf balls! Enclosed pools stay cooler in the summer and warmer in the winter. Your pool maintenance gets easier as well keeping leaves and wild animals out. Isn't it about time you and your family start spending more time outdoors around the pool? Looking to increase the privacy of your pool? Screened in pools can block out harmful UV rays and nosy neighbors! Best of all the screens don't have to obstruct your view out. Pool enclosures come in all shapes and sizes and every project is unique but we have designs to meet every budget. We'll need to know a bit about your pool size, why you're interested in a custom pool enclosure and if your structure will be attached to a house or will be a free standing structure before proving you with an estimate. Rest assured our design consultants and installation team have decades of experience between them and can answer all of your questions. If you see a pool enclosure you like or want to discuss your options please give us a call or fill out the form on the right and we'll get in touch with you soon. If you'd like to know more about the cost then check out our page on how the price is determined. We offer many different types of pool enclosures ranging from stylish yet affordable screened in pool enclosures, glass pool enclosures for more complete protection from the elements to more versatile retractable options. In addition to the deciding on which material you want to enclosure your pool, there are six main roof types to choose from including flat, sloped, gable, dome, mansard or hip styles. Each have their own unique look and our consultant can help you decide which would look best. What makes Houston Pool Enclosures different from the rest? We focus on building beautiful custom pool enclosures that not only increase the enjoyment you get out of your pool and backyard but also enhances the aesthetic of your home. Some pool enclosure companies offer options which are cheaper in price and style but we are suckers for good design and are always looking to create the most beautiful enclosures we can. Whether you like the look and feel of one of the enclosures on our site or have an idea all your own, or are working with an architect who has come up with your design, we want to discuss how we can help. Please give us a call on 281-519-7322 or fill out our contact form above to schedule your free consultation. Call Us Now on 281-519-7322 or Leave your details below and we'll get back to you within 24 hours. Thank you for reaching out to us. We will contact you soon to discuss your new project.